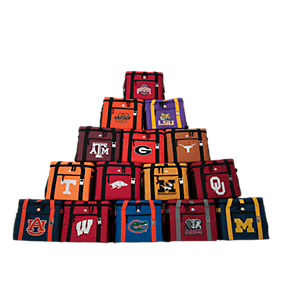 Igloo Products Corp., the nation’s largest cooler manufacturer, has expanded its line of collegiate licensed coolers for tailgaters, and other college fans. Igloo has grown the program to a total of 23 universities in both hard and soft-sided products. It has wheels and a locking, telescoping handle which allows the cooler to be pulled or pushed; four drink holders molded into the lid and a recessed drain plug which makes emptying melted ice a breeze. It’s a tailgater’s best friend." 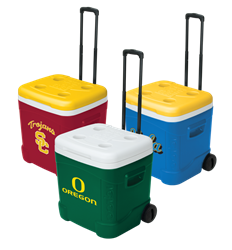 Igloo Products Corp., the nation’s largest cooler manufacturer, has expanded its line of collegiate licensed coolers for tailgaters, and other college fans. The program, which launched in 2012, consisted of one of Igloo’s most recognized and best selling coolers, the Ice Cube 60 Roller, decorated in 15 different official school colors and logos. Igloo has grown the program to a total of 23 universities in both hard and soft-sided products. According to hard-sides product manager Michelle Stone, adding more schools and products has always been a goal of the program. “As soon as we launched the program in 2012, we began to receive calls and emails from consumers and retailers alike requesting more schools and products,” Stone explained. Igloo will continue to offer the Ice Cube 60 Roller for 2013, and has added the 45 Can Ultra Collegiate Cooler—an upgraded soft-sided cooler bag—to the line. The Ice Cube series of products reshaped the cooler industry with an ergonomically square shape that is easy to carry. Although it’s the Ice Cube 60 Roller’s features that made it the first choice for a collegiate licensed cooler. “It has wheels and a locking, telescoping handle which allows the cooler to be pulled or pushed; four drink holders molded into the lid and a recessed drain plug which makes emptying melted ice a breeze. It’s a tailgater’s best friend,” said Stone. Igloo soft-sides product manager Melissa Pooler says the 45 Can Ultra Collegiate Cooler was chosen for its upgraded features that will appeal to tailgaters. “The 45 Can Ultra Collegiate cooler is tough, featuring 600D outer material and extra thick antimicrobial liner that is puncture and leak resistant. With extra thick insulation and non-slip feet that raise the cooler off of hot surfaces, it also provides long lasting ice retention—two days—which is a necessity in the sweltering heat in the fall at some of these universities. Add the adjustable, padded shoulder strap, comfort grip handles and bottle opener and you have the perfect tailgating accessory,“ said Poole. Igloo is licensed with 19 universities through the Collegiate Licensing Company, LLC, an affiliate of IMG College, including The University of Alabama, Auburn University, University of Arkansas, The University of California Los Angeles, University of Florida, University of Georgia, Louisiana State University, The University of Michigan, University of Missouri, The University of Oklahoma, Oklahoma State University, Oregon State University, University of Tennessee, The University of Texas at Austin, Texas A&M, The University of Washington, Washington State University and University of Wisconsin. Igloo has one license from the Licensing Resource Group—The University of Hawaii—and four from independent institutions—The University of Oregon, Michigan State University, The Ohio State University and The University of Southern California. Both the Ice Cube 60 Roller and the 45 Can Ultra Collegiate cooler are currently available at retail. The Ice Cube 60 Roller retails between $40 to $60 and the 45 Can Ultra Collegiate cooler ranges in price from $30 to $50, depending on retailer. For further information about the collegiate licensing program or about any other Igloo product, contact Katie Davis or visit the company’s Web site at http://www.igloocoolers.com.